L & J Industries, Inc. has been located at 1811 Cleveland Avenue since its inception in 1965 by James B. Garden. We are a full service metal manufacturing facility specializing in Free-Flow Floor Supports. We are marketed to distributors and dealers of grain bins and equipment. L & J Industries, Inc. has seen many changes since it began as a small welding and repair shop known then as L & J Welding. In 1986, Chris Garden (James's son), became an active employee which led to assistant manager in 1991. 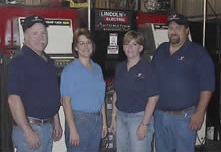 Due to increased sales and building expansion, L & J Welding became incorporated and is now known as L & J Industries, Inc. Chris and Lisa Garden became sole owners/proprietors in 2003. Our staff includes Chris Garden as the President, he does the buying and oversees all aspects of the business. Alan Kolbet as Plant Operations Manager, who has been with L & J Industries, Inc. for over 25 years. Al oversees the day to day planning and operation of the production area. Teresa Miller is Office Manager handling accounts receivables, payables and payroll. She is also the Safety and Compliance Coordinator and has been with L & J Industries, Inc. for over 10 years. Lisa Garden is the Trucking/DOT Compliance Coordinator for the shipment and delivery of floor supports and for products shipped for other companies. Jacie Garden is the Marketing Coordinator and runs the facebook page, website, redesigning the Winter Programs, and networking with and quoting floor support customers. She created a L&J Newsletter email list for floor support customers to stay up-to-date on specials and information - email jacie@ljind.com if you'd like to be added to the list!